Buying accessories for a Mac can be somewhat of a minefield - there's certainly no lack of choice. So we've selected 12 of the very best for you to choose from - which is your favourite? Our first WaterField sleeve is incredibly versatile and configurable. The sleeve is made from high-grade neoprene with a nylon shell. It's available in horizontal or vertical orientation, and with or without a flap. Add optional D-rings and you can also throw in a shoulder strap. There's even an optional piggyback pouch that fastens to the D-rings and holds your charger and other accessories, so you can use your SleeveCase as a simple sleeve or a full notebook bag. It's versatile, attractive and fun. 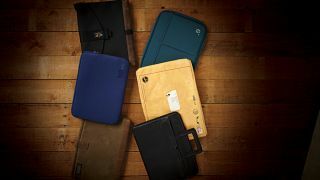 Although not as stylish or robust as the be.ez case, this Tucano case does indeed fit your MacBook like a second skin. We liked the elasticated flap inside the case, which stretches over your notebook and stops it getting scratched by the zips. The velvet-like black lining is appreciated too. The case is made from neoprene and is available in black, blue, red or grey, and because it's tight-fitting and relatively thin, it should fit comfortably in your notebook rucksack or shoulder bag. It's also available for the 15-inch MacBook Pro too. A good sleeve at a good price. With its waxed canvas build and leather trim, WaterField's Outback range of cases and sleeves have a real rugged outdoor feel to them. This one's available in horizontal or vertical orientation, and with a choice of trim styles. It's extremely robust, but we wish the holding flap was secured with a magnet instead of a press stud. Pressing down hard onto your notebook to close the fastener is far from ideal. It's opentopped too, so it won't keep out dust and dirt, which is surprising for such an outdoors-themed sleeve. You can't go far wrong with a be.ez notebook sleeve. Their low-resistance polyurethane memory foam means they give excellent protection against knocks and scrapes, and they're extremely well built, with sturdy metal zips, and solid, heavyweight stitching. This model has useful front pockets for notes and documents too. The one reviewed here is a fetching shade of teal, with an orange lining. They've also made one of the zip fasteners orange, which gives a nice little splash of contemporary colour when the case is closed. It might not be the best-looking sleeve around, but there's method to its undeniable madness. The Stealth Laptop Sleeve is designed to look like a tatty, used padded postal envelope. It even rustles like one. But its padded lining, waterproof exterior and velcro fastenings keep your notebook safe and sound, from thieves as well as bumps and splashes. By disguising your notebook as a shabby post bag, it's far less likely to get pinched. If you regularly carry your MacBook under your arm, it could prove invaluable. This high-end sleeve is designed to stay in place while you use your MacBook. The zip extends all the way down to the base of the sleeve, and elastic straps hold it fast to the corners of the notebook's base and screen. Made from high-quality real leather, it features a single zipped pocket at the front and retractable handles so you can carry it like a briefcase. It's not cheap, but like most sleeves and cases in Toffee's range, you can't fault it for quality or style. Just the thing for the Mac-loving city executive.